Boone Aviation News: Ames Pancake Breakfast Fly-In this Saturday! 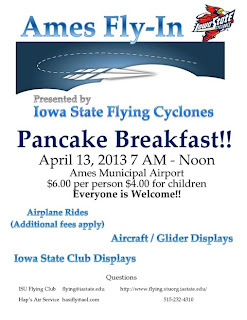 Ames Pancake Breakfast Fly-In this Saturday! 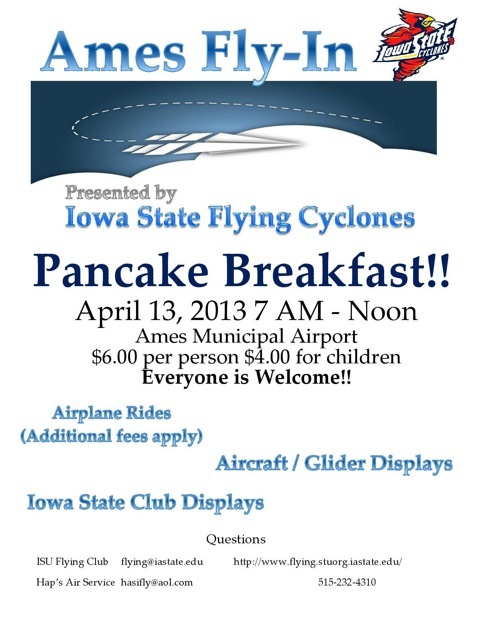 The Iowa State Flying Cyclones Pancake Breakfast/Fly-in scheduled for this Saturday, April 13, starting at 7am at the Ames Municipal Airport. There be several ISU club displays, airplanes, the Iowa Hieratage Museum is setting up a display, and Chris Cakes breakfast and coffee will be served for $6; kids $4.